The higher-frequency flavor of Wi-Fi used by 802.11n and 802.11ac can have higher power output and further range by picking the right channel. A frequent reader problem related to Wi-Fi—one I hear all the time as a result of having written books about Wi-Fi and Apple’s AirPort base stations for a decade—is getting good coverage, even when a network is seemingly well planned. But there’s one simple change you can make that could have a surprisingly strong effect. I swear this article isn’t clickbait: Rather, there’s a signal-strength property that’s not well known. Modern Wi-Fi adapters and base stations can use two frequency bands: 2.4GHz and 5GHz. The lower-frequency 2.4GHz band suffers from a lot of competing uses beyond Wi-Fi (Bluetooth, baby monitors, industrial sealers, microwaves, medical devices, and a lot more), but it’s better at penetrating walls, floors, and ceilings than the higher-frequency 5GHz. The 802.11b, g, and n standards can work over 2.4GHz. In the 5GHz band, channels don’t overlap, and there are a bunch of them available—eight using Apple’s current base station generation and more using equipment from some other makers. That makes interference less likely. Both 802.11n and 802.11ac can bond together multiple 5GHz channels, which is how they push through hundreds of Mbps to nearly 1 Gbps depending on the circumstances. Wireless Options lets you lock a channel for the two frequency bands used by Wi-Fi, but also set a distinct 5 GHz network name to separate out usage. 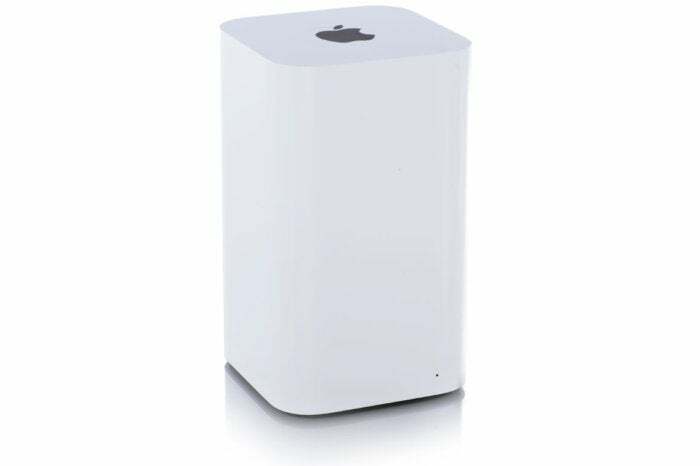 Apple’s base stations and those of most manufacturers are set by default to choose Wi-Fi channels automatically. Some base stations prefer the higher-numbered, higher-powered channels, but others pick the least-congested channel. Because channels 149 and up can push out more power, they can also be “heard” from farther away, and are thus likely to seem like interference to a router trying to find an uncongested channel. You can see what channel a base station has been assigned to using OS X by holding down the Option key and selecting the Wi-Fi menu, then selecting Open Wireless Diagnostics. In that hidden app, choose Windows > Scan, and you can see all base stations within range with a variety of details, including their channels. Select your base station and click Edit. Click the Wireless tab, and click Wireless Options. From the 5GHz Channel menu, select 149 or higher. Click Save and then click Update. Your base station will restart. 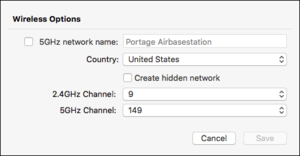 If you want to be sure to lock devices to the higher 5GHz band, there’s no setting in iOS nor in OS X, but you can use that same Wireless Options dialog to check 5GHz Network Name and name that base station (or each base station you have) to a distinct name from the 2.4GHz network. The Wireless Diagnostics program has a scanner that shows you all the base stations around your Mac. Then, on every device you want to lock to 5GHz, use Settings > Wi-Fi in iOS or the Network preference pane’s Wi-Fi adapter’s Advanced dialog to forget the 2.4GHz network name. Connect to the newly named 5GHz network, and all your devices that support 5GHz (all modern hardware) will only use that band.